In search of health and ‘hoppiness’! Kangaroos and wallabies, collectively known as macropods, are found in zoos all over the world. But, for reasons that are not yet clear, these animals suffer with a condition that seriously affects their welfare – ‘lumpy jaw’. Lumpy jaw is a bacterial infection of the oral cavity that is distinguished by characteristic proliferation of the jawbones.The condition is painful, difficult to treat, and often results in the death of the animal. Lumpy jaw is frequently found in zoo macropods, but is rare in the wild. It is therefore suggested that aspects of macropod captivity may be associated with the occurrence of lumpy jaw. My PhD is investigating the extent of the lumpy jaw problem in zoos across Australia and Europe, where macropods are popular exhibits. I am also investigating aspects of macropod housing and husbandry that may influence the development of this painful condition. Results from this research will be used to develop new husbandry guidelines for the care of macropods with the aim of reducing incidence of lumpy jaw and subsequently improving the health and welfare of one of Australia’s most iconic species. What is CAWSEL All About? Described in the past as “animal welfare boot camp”, CAWSEL is only but a remarkable and professionally developed range of courses aimed at providing attendees with a broad appreciation of animal welfare science, ethics and law. Four individual courses merge under the umbrella of CAWSEL and tackle a vast array of topics, such as: Welfare Concepts & Assessment, and Zoo Animal Welfare; Law, Companion Animal and Horse Welfare; Principles of Ethics in Relation to Animal Use and Farm Animal Welfare. The decades long legacy of CAWSEL is a testimony to its valuable content and the individuals it brings together. Veterinarians, vet nurses, animal welfare and animal science researchers, students and animal charity workers and campaigners from every corner of the world come together for two weeks every year in mid-September, to hear from leading experts and learn through a combination of lectures, discussions and videos. 15 of the world’s experts in animal welfare, eminent academics, researchers, professionals and pioneers in the filed deliver the ever changing and up-to-date material, sharing knowledge and experiences to better equip attendees to improve the lives of animals. Professor Emeritus Donald Broom (Cambridge University) delivers a large part of the Courses. 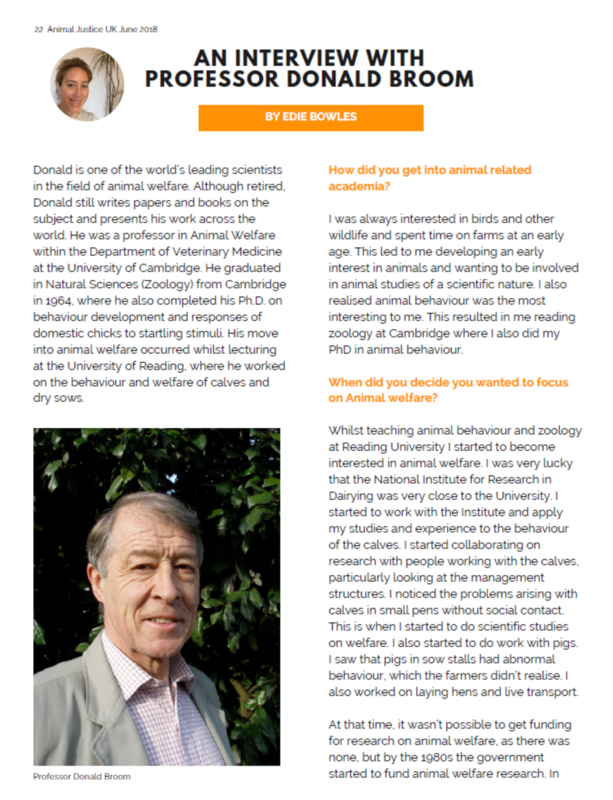 Donald was appointed the first Professor of Animal Welfare in the world in the Department of Veterinary Medicine, University of Cambridge in 1986 and, although now retired, is still a driving force in the field, writing papers and books and presenting around the world. Course organiser, Dr Anthony Podberscek, teaches on the subject of companion animal during Course 2 of CAWSEL. After receiving a PhD from University of Queensland, Anthony became post-doctoral research associate in the Department of Veterinary Medicine at the University of Cambridge and is now back ‘down under’ as affiliate of the Faculty of Veterinary Science, University of Sydney. For the past 21 years Anthony has been editor-in-chief of Anthrozoös. Although he recognises that advances in technology have led to courses increasingly being taught online, Anthony is proud that: “CAWSEL bucks the trend and continues to bring everyone together – enthusiastic students and teachers – in one real and beautiful place, Cambridge”. Have we convinced you yet? If not, there’s much more to explore on our official website: www.cawsel.com or you could always get in touch by emailing CAWSEL@opening-doors.org.uk. We would love to hear from you!